Container hosting popularity has significantly increased in the computing world. As a result, so many people want to use containers without understanding whether container hosting is what they really need. There are different container hosting technologies to choose from, but what is most important is understanding the little differences in these technologies and which are best suited to your needs. In actual fact, containers have been in existence for a long time in the form of hypervisor based virtualization. Hypervisors emulate the infrastructure, meaning a user can run an operating system on top of another. For example, Linux on Windows or vice versa. Both the host and guest operating systems run with their specific kernels and the communication between the guest software and the hardware occurs through the hypervisor’s abstracted layer. vironment that packages and isolates certain processes and resources such as disk space, CPU and memory from other containers including the host. This isolation ensures that any process on the container cannot see any resources or processes that are outside the container. 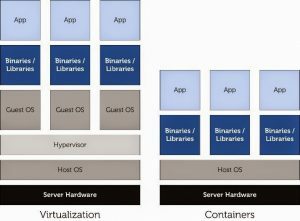 The major difference between a container and a Virtual Machine is that containers share the same host system and kernel. This in turn gives them the edge of being very efficient and fast with no performance overhead compared to Virtual Machines. These are virtual environments that provide user space isolation but share the OS kernel of the host. For practicality purposes, OS containers can be viewed as Virtual Machines. These allow users to install, configure and operate different apps or libraries just as you would on any operating system. Similarly to a Virtual Machine anything that runs inside a container will only see the resources that are assigned to it. Operating System containers come in handy when a user needs to run a series of identical distros. In most cases these containers are created from images or templates that determine the contents of the container. This allows users to create containers with similar environments and configurations. Application containers are made to package and run only one service unlike operating system containers that can run multiple processes. Some examples of application container technologies are Rocket and Docker. Containers offer the full advantages of full virtualization such as partitioning of modern servers into smaller units that can be shared in a secure way. This is made possible by the fast boost speeds as well as the capability of having multiple instances which allows for faster testing. This is not only efficient but also time saving. Though containers have been around for quite some time, the technology is continually evolving and more and more tech companies are investing heavily in this sector to make it better. Uses can therefore look forward to create developments. Container hosting technology has grown in leaps and bounds explaining why so many owners are interested in the technology. It’s however important to determine what type of container technology they need for their particular niche. Start by running a background check to determine which provider is going to meet your needs best in terms of cost and services.